The "Invasion" scenario offers 2 to 5 players to work together to defend the city. Can you join forces to save Orleans? In the 2-player variant "The duel", you play directly against each other. The player who first succeeds his 4 goals wins the game. Discover totally new modes around the famous "bag building" game in 6 new scenarios! Be careful this game is an extension of Orléans and cannot be played alone. 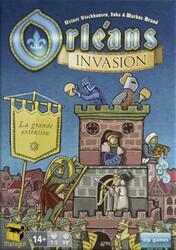 To be able to play it you must have a copy of the game Orléans .